When the average man goes to the gym, all he has on his mind is making his biceps bulge a little more, or benching five pounds over and above his previous best, but when an engineer goes to the gym, he sees a prime opportunity to analyze a great example of a linkage and pulley system. 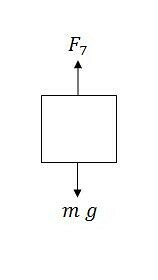 Through the study of the dynamics of machinery, and utilization of the matrix method of analysis, an individual can derive mathematical equations defining force, position, velocity and acceleration with only the knowledge of a few of the linkage lengths and angles of interest. To demonstrate this method, a calf-raise machine found within the TTU Fitness Center was observed, measured, and analyzed to derive its given forces, position, velocity and acceleration at a certain point within its travel of function. In regards to specifics, the mechanism was composed of a standard four bar linkage attached to a pulley system which channeled the force of a selected number of ten pound weights opposing the upward force exerted by the user’s body. By identify particular ground points, identifying the lengths of ten links, and dividing the mechanism into three separate loops from which position equations could be derived, the system was made possible for analysis. 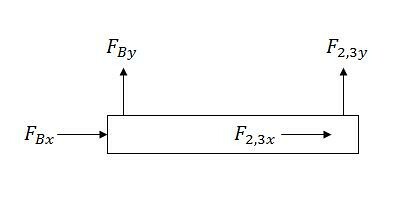 The force analysis of the mechanism was achieved by dividing the system into seven components, creating free body diagrams on each of the defined components, and deriving force equations from the FBDs which solved for the force composition in both the x and y direction as well as computing the moment forces at a specific point on the component. This resulted in twenty one equations with twenty one unknowns. 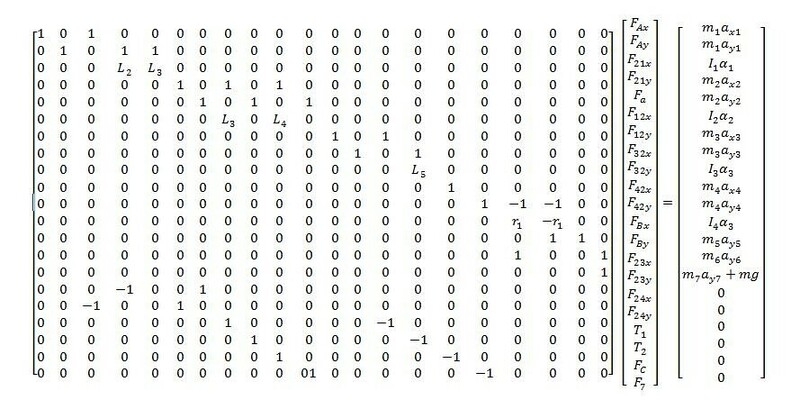 These equations were then organized in matrix form and ran through Matlab to derive our desired unknowns. The discussed analysis, methods, and calculations can all be seen in the below workspace. The graph shows that as the operator lifts the weights, there is parabolic increase in force needed to raise the desired weight. 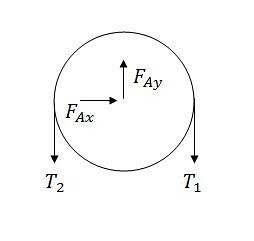 This can be seen from the position/velocity/acceleration equations in their polar form. 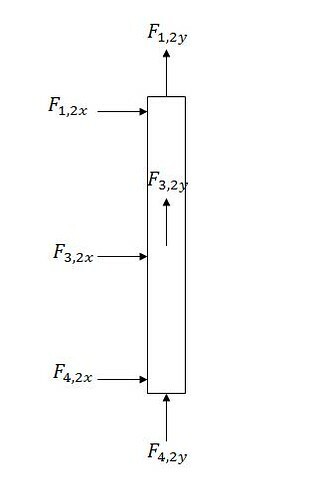 This figure shows that as you increase the weight it takes more force from the operator to raise the bar. This is not a one to one ratio because of the added weight of the other machine components. 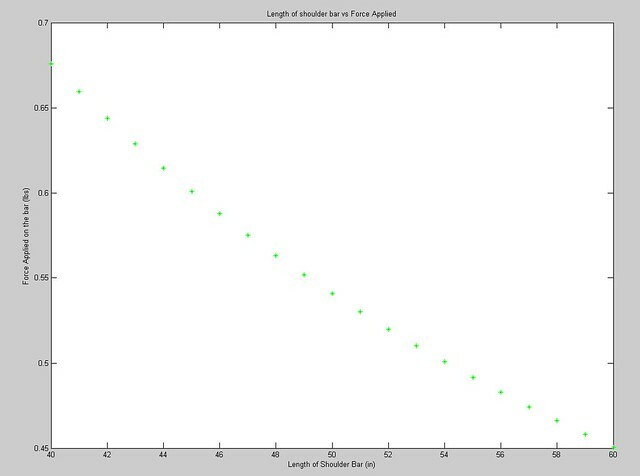 This graph shows that as you increase the length of the shoulder bar from 40in to 60in the force required to raise the weight is decreased exponentially. This can be proved once again if we look at the position/velocity/acceleration terms they have exponentials in their polar formats.